Clan Wars are becoming harder with each passing week as players level up their defenses, some to max, and the war matching algorithm slowly works to eliminate engineering advantages. While so many Town Hall 10s and 11s now on the war map, it becomes critical to be able to three star all of the Town Hall 10s, or at the very least a two star with 80% or higher destruction. Traditional attacks may not always work, which is why it is important to learn multiple attack strategies to be prepared to take out any base. 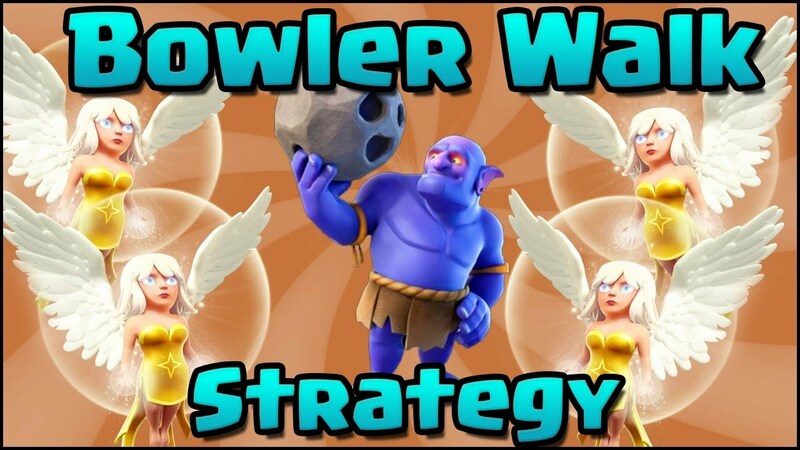 In this article, we will break down the Bowler Walk strategy, supported by Witches that has become commonplace among the top Town Hall levels. Here is the number of troops and spells you will need to complete the Bowler, Healer, Witch attack at Town Hall levels 10 and 11. Combination of Freeze and Heal for the last spell space and in your Clan Castle. This depends on the type of base and setup, which we will cover below. There are two paths along the outside of the base that units can walk along to create a funnel into the core of the base. The core of the base, and most importantly the two infernos are accessible from your entry point via two jump spells. The Clan Castle will be triggered and target the main army and not one of the sides. If that is the case, then you will need to consider moving the entry point or sending the Archer Queen to that side to eliminate the castle. The reason you want to avoid circle bases is that you are unable to predict their pathing, which is key to successfully executing this attack strategy. Once you have the army built and the war base targeted here is the step by step guide to the Bowler, Healer, Witch attack. (Note: This will be for Town Hall 11 armies, adjustments noted at the end). Side Armies – Drop 4 Bowlers, then 2 Healers and finally 2 Witches on one side of your funnel. They will then walk down that wall creating one half of the funnel. Then repeat on the other side of the base. Jump Spell 1 – In the center of your entry wall drop the Jump Spell to ensure that the pathing heads towards it. A max Jump Spell lasts a minute, so don’t worry about it running out. Core Army – Drop the remaining 6 Bowlers + your Clan Castle troops, then the last 2 Healers, the last 2 Witches, then your heroes in Barb King, Grand Warden and Archer Queen order. The Warden helps heal the core army, while the Archer Queen remains protected in the back. Rage / Poison / Warden Ability – As the core army enters the base the Clan Castle troops should exit and head towards them. Immediately drop your poison on them. Rage your troops as they get inside the base, ideally targeting the first Inferno Tower. Then use the Grand Warden ability as the CC troops approach and/or the first Inferno Tower is engaging your army. Jump Spell 2 – Then quickly place your second Jump Spell to dictate the pathing of the core army. You’ll want it to head towards the 2nd Inferno Tower. Remaining Spells – Use a Freeze Spell to buy your troops a few extra seconds against the last Inferno Tower. If you took a Heal Spell, you can elect to use it either in between the two Inferno Towers or on a side army that is encountering a lot of point defenses. (a) place only 1 witch with each side army. (b) save the wizard for cleanup where the most % points can be gained. (c) aim at the Town Hall side, to secure the two star, hoping for three. Get your lab going to get these troops and spells maxed out – including your Warden! Enjoy practicing the attack in challenge mode and watching is destroy Town Hall 10s in war. Good luck and clash on!